Inle Lake is a magical place where villages and monasteries rise from the water amid floating gardens, hill tribes inhabit the shoreline, and the only way to get around is by longboat. These traditional wooden boats are plied by boatmen using a unique one-leg rowing technique to transport goods and passengers, fish and go to market, all with the green, cloud-covered mountains of southern Shan State rising around the lake’s placid waters. 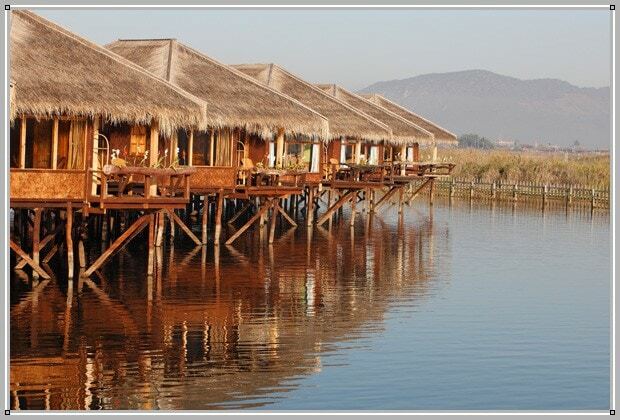 Shwe Inn Tha Floating Resort is situated in a secluded spot about two-thirds down the lake, perched serenely on wooden stilts just above Inle Lake. Arrival here by boat from Heho Airport or surrounding towns, as well as subsequent visits to the lake’s restaurants, markets and villages, is like stepping back in time several hundred years. Life in this enchanting part of Myanmar is lived the way it has been for centuries, and the people are gracious and welcoming, if a bit shy. I concur – this was by far my favorite spot in my travels through Myanmar. 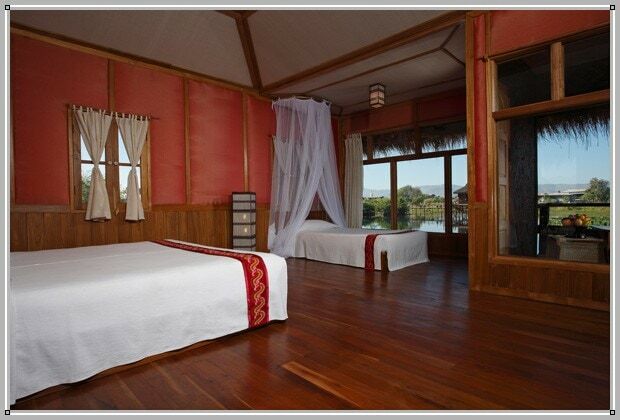 Each suite is an individual thatched-roof bungalow, with extremely spacious rooms and gleaming teakwood floors and ceilings. True to the peaceful, traditional philosophy of the place, there are no televisions in the rooms and no internet connection. Mosquito nettings are provided to sleep under, and give a romantic allure to the comfortable beds even when not exactly needed for their purpose. Bathrooms are fully equipped with separate toilet room, large soaking tubs and attached private outdoor shower that is open to the sky above. Mini-fridge and electric kettles for morning tea and coffee are also provided. 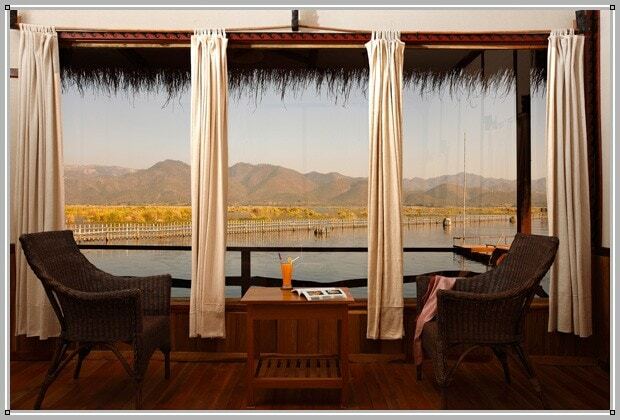 Each bungalow has its own deck with chairs and a table, perfect for enjoying an evening drink while watching the spectacular sunset create an amber glow over the mountains, lake and Shwe Inn Tha. 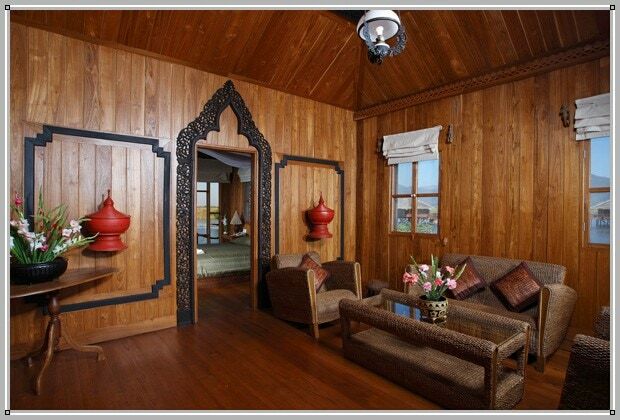 The open-air pavilion and sitting area greets you as you first arrive at Shwe Inn Tha, pulling up alongside the wooden steps in your boat. 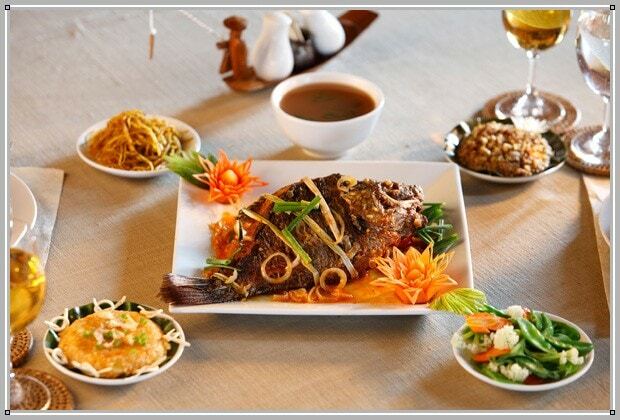 Just beyond this common area is the resort’s restaurant, a large space that serves top-notch local Tha and Shan cuisine, as well as a selection of Indian, Singaporean, European and other international dishes. Don’t miss the Shan Noodle Soup at breakfast. There is also a decent selection of wine, beer and mixed-drink cocktails on offer. 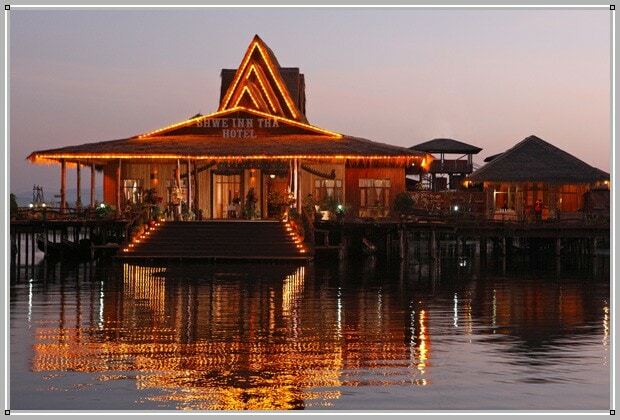 Because the lake is dangerous to navigate at night, most evening meals are taken here at Shwe Inn Tha’s restaurant – but with such a large menu, there’s plenty to keep it varied and interesting. The resort also has, improbably, the only floating swimming pool I have ever encountered. The pool is filled with naturally treated and filtered water, surrounded by a large deck and comfortable lounging beds to create a refreshing afternoon retreat from sightseeing on warm days. Spa services are also available – and like the pool, it is sure to be different from any other spa experience you have encountered. 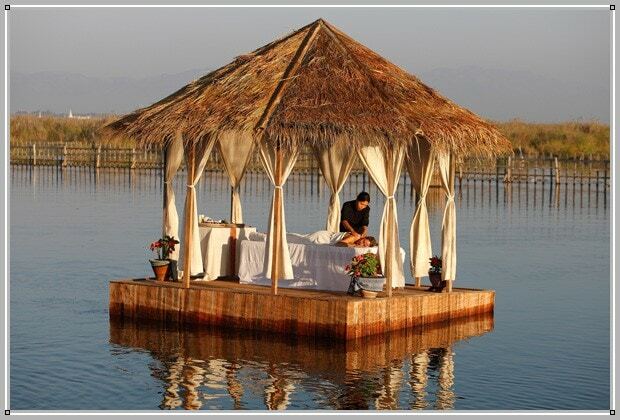 Massage, facial and other spa services are provided on your own open-air, floating pavilion by a skillful Burmese therapist, using traditional oils and local herbs. 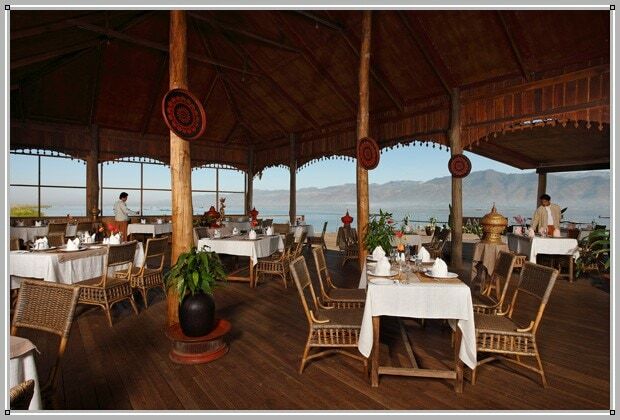 Don’t be deceived by the quiet, secluded aura that envelops Inle Lake – there is plenty to see and do here, and you could easily stay occupied for several days or a week. 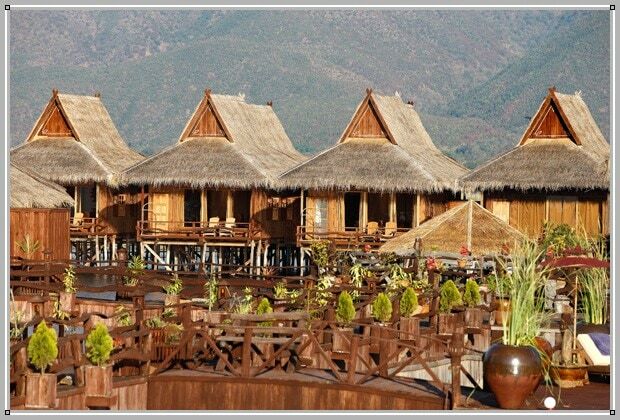 The resort has numerous longboats on standby to take guests to the nearby villages and sights, and the Shwe Inn Tha staff is excellent at making recommendations and crafting an itinerary for you. Local markets are one of the most fun attractions; check out the Ywama Floating Market, or the rotating market that moves to a different lake village spot every five days. At these markets, as well as the vendor stalls around temples and attractions, the proprietors are friendly and much less pushy than in Yangon or Bagan; it seems that the easy, laid-back nature is just a way of life here. Many of the hill tribes come down to these markets as well, with their colorful turbans and shy smiles. Once done with shopping and eyeing local market delicacies, there are plenty of opportunities to get in touch with the soul of Myanmar. Start at interesting Nga Phe Chaung, also known as the “jumping cat” monastery. This is a small place that is home to a handful of monks, with a collection of elaborate Buddhist statues in the center of the main hall, but pretty simple otherwise. Apparently, the remote location created a lot of boredom for the monks when they weren’t studying or praying – and so to amuse themselves, they began teaching the dozens of resident cats how to jump through hoops. The monks are very friendly and forthcoming, and will easily sit down and strike up a conversation with visitors; for a small donation to the monastery, they will gladly put on their trained cat show. Also, don’t miss the temples located a short walk up the mountain from Indein Village; here you can walk amongst dozens of ancient stupas in varying states of ruin or renovation, Indiana Jones style. The Pindaya caves are also worth a visit, with their hundreds of Buddha images. 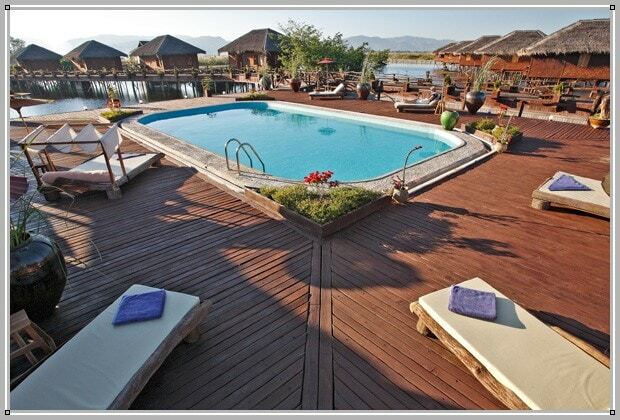 Very nearby Shwe Inn Tha resort are a number of floating gardens, where locals grow and tend to flowers and vegetables such as tomatoes, peppers and many others. The gardens make for a nice boat ride; as do the neighboring villages that are home to workshops where you can watch traditional artisans work crafts that have been handed down through generations, such as silk weaving, silver- and black-smithing, and wood carving. And if you’re lucky, maybe your visit will coincide with one of the many pagoda festivals of Inle Lake, a time of celebration and music when Buddha images are moved by boat from one pagoda to another. Most festivals are held between October and May; the resort can help you plan for this. • Not any nightlife to speak of; you should be back at the resort before nightfall, where you can eat and have a drink but otherwise must entertain yourself. Music, reading material and card games recommended. • It’s a bit of a trek to get here – you must fly into Heho and then take a taxi to the boat jetty at Nyaungshwe (or drive directly into Nyaungshwe), then travel by boat 45 minutes to Shwe Inn Tha. It’s a beautiful journey, though, and well worth it. • There are no ATM machines in Myanmar, and few places accept credit cards. Be sure to bring enough cash in U.S. dollars (accepted everywhere) for your entire trip, including internal flights.